Following uncomplicated cataract surgery, clouding and fibrosis of the posterior capsule is a common cause of decreased vision that is usually easy to diagnose and treat. However, other capsular-bag conditions that are more difficult to detect can also decrease vision. One of these is capsular bag distension syndrome (CBDS). CBDS is a complication of cataract extraction that occurs when turbid fluid accumulates behind the lens implant. It can happen with or without refractive change. While CBDS is not common (one study found that it occurred in less than 1% of cataract cases), it is a well-recognized cause of reduced vision following cataract surgery. Although this condition usually presents in the immediate post-op period, it can diminish vision many years after surgery. Over time, the capsular bag contracts around the lens implant with the beneficial effect of helping to lock the lens implant in place. However, as the capsule tightens, it can also create a unique environment that decreases vision while the posterior capsule remains clear. After the cataract lens material is surgically removed, the posterior capsule is often polished to get rid of remaining lens cells. But complete elimination is almost impossible. 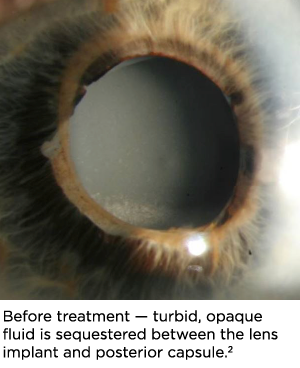 Although many lens implants have edge designs that attempt to limit cellular migration across the capsule, the incidence of posterior capsular opacification (PCO) is still about 30%. In most cases of PCO, retained lens cells proliferate across the visual axis and the posterior capsule becomes cloudy. 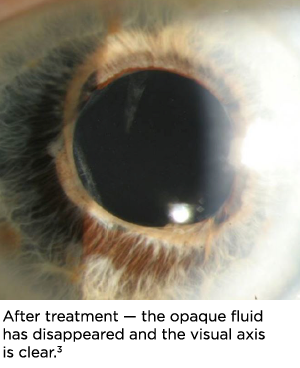 This usually can be seen easily on slit lamp examination—especially with retro-illumination. However, as the capsule shrinks around the lens implant, a seal can sometimes trap normally circulating fluid into a closed environment between the lens and posterior capsule. With time, this entrapped fluid becomes turbid and opaque. As fluid accumulates, the lens implant is pushed forward while the posterior capsule bows backward. 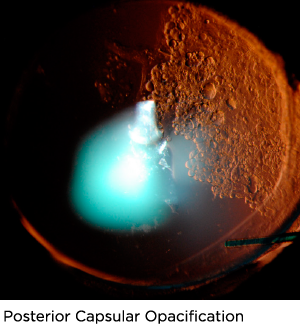 The above photo shows a well-centered lens implant with a clear posterior capsule but an enlarged space between the back surface of the lens implant and posterior capsule that is filled with a smoky, turbid fluid. This layered effect is known as a retrolenticular pseudohypopyon. Timing of CBDS onset provides clues to the entrapped fluid’s composition. If the condition is noted within a few days or weeks of surgery, retained viscoelastic agents are the most likely cause. 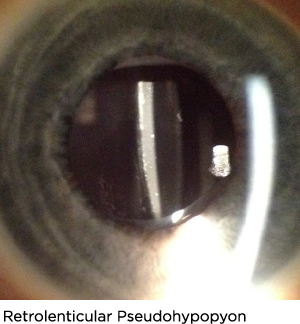 This type of CBDS is more often associated with myopic refractive shifts and forward dislocation of the iris/capsule/lens complex. Careful removal of any viscoelastics used during surgery will prevent this manifestation. Later onset CBDS can occur months to years after cataract extraction. While the presentation may be similar, the mechanism is thought to be different. As the capsule contracts around the implant lens, a closed space is formed where retained lens cells initially proliferate but later degenerate. This creates the turbid fluid behind the lens implant. A sample of retained fluid was obtained in a published case report (JRSM Short Rep. Jun 2011; 2(6): 53). Analysis showed large amounts of alpha-crystalline, indicating that the fluid was derived from retained lens epithelial cells. This condition is not usually accompanied by inflammation or increase in IOP. Vision worsens with time and is often described by patients as being foggy or dimmer than the other eye. Timely treatment of CBDS can restore the normal shape and position of the lens capsule and lens implant, correcting the myopic shift and improving vision. The most common treatment is careful Nd:YAG laser posterior capsulotomy that vents entrapped fluid into the vitreous cavity. As the lens implant returns to its normal position, other anatomical relationships are restored and visual acuity improves. If the posterior capsule is clear, an alternative but much less common Nd:YAG laser treatment option is to make a small opening in the anterior capsule just peripherally to the edge of the lens implant. This allows the accumulated fluid to vent into the anterior chamber where it is quickly cleared by the normal turnover of aqueous humor. Following this procedure, there may be a slightly higher risk of post-YAG inflammation so a short course of topical steroids is often prescribed. Be vigilant with either treatment for signs of unusual inflammation during the initial post-op period. While rare, cases of P. acnes infection/endophthalmitis have been reported following any type of Nd:YAG treatment to the capsule. The mechanism is thought to be the result of a sequestered low-virulent organism that is released into the vitreous during the procedure. If you encounter a patient who is experiencing reduced vision weeks or even years after cataract surgery due to a myopic shift and/or turbid fluid behind their lens implant, CBDS may well be the cause. Because our doctors have the privilege of seeing so many cataract patients, most of us have gained experience with this condition and are very willing to assist when needed with your diagnosis. If you have questions or wish to discuss a specific case, always feel free to call any of our optometric physicians.